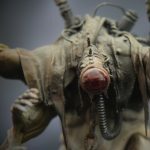 This How to Sculpt Miniatures series is my attempt to demystify the idea of sculpting your own miniatures. It seems that more and more people are taking cracks at it these days as the means of production are getting so very cheap and third-party casting companies are growing like mushrooms. Still, no matter how many head-swap bits are retailed, there is going to come a time when you have an awesome idea for a miniature, and there might not be a compatible, ready-made bit. You're going to have to make it yourself, and it is my belief that the only thing standing in your way is a few helpful tips. Like I mentioned in my previous article on tools: I don't consider myself a trained professional, just an experienced amateur. Thus, I'm going to be talking about the putties I use, but, unfortunately, I won't be able to tell you anything about super sculpey or milliput, procreate or brown stuff. But that's alright because it's my goal to convince you that all you really need for 98% of your sculpting projects are two reasonably cheap, readily available putties. This article will be a general overview with a few tips about how to have more control over your putty, but it got a little long, so I will be saving hands-on techniques for my next installment. Still, I hope you find this one helpful in getting you better acquainted with sculpting mediums. UPDATE: I've just polished off the video versions of these tutorials, and you'll find the second video, all about putty, below. The video is best consumed as an illustration to this article, so I'd still recommend reviewing both. ENJOY! Kneadatite Blue Yellow Epoxy Putty. Also known as Greenstuff. The putty you've been using for years, or, possibly, the putty you've been swearing at for years as it stuck to your fingers and refused to do what you asked of it. As can be surmised by the fact that Games Workshop packages it, this stuff has been the de-facto king of miniature sculpting for decades. When it comes to using Greenstuff, I'm assuming most people are aware of the operation of the stuff. Cut off equal parts yellow and blue. Mix together until even green. Apply to model. Rinse. Repeat. GAH! MAKE SURE TO REMOVE GROSS BLACK FIBRES. I THINK I MUST HAVE DROPPED THIS ON THE CARPET AND NEVER NOTICED THE FIBRES WHILE SCULPTING. THAT'S A LITTLE EMBARRASSING. The only thing you have to watch is, if you're unfortunate enough to get stuck with the kneadatite blue/yellow ribbon, you have to be sure to cut out and throw away the bit in the middle where the two-parts-that-shouldn't-touch-until-you-want-to-use-them are, annoyingly, packaged in contact with each other. Grrr. If you've ever used it before, you know that Greenstuff is as sticky as heck, and one of the things I found most frustrating when I began working with it was the experience of the putty sticking to my fingers rather than the model I was trying to apply it to. We'll get to how to alleviate that problem when I talk practices later in this series. Sure, you can buy it on eBay for way cheaper than Games Workshop's price, but as soon as you start sculpting in earnest or try to make anything larger like monsters or terrain, you start using up Greenstuff very quickly, and the cost of the stuff begins to become apparent. Aves Apoxie Sculpt. If there was a subtitle for this article, it would be either "or How I Learned to Love the Apoxie" or "How to Use Aves Apoxie Sculpt Because All My Friends Are Doing It." If there is one thing I'd like for you to take away from this article, it is the name "Aves Apoxie Sculpt." I, foolishly, kind of assume that everyone knows about Apoxie Sculpt and that it's yesterday's news because I've been happily using it for years. Aves isn't paying me to say this (hell, I wish they would), but I can't understand why this putty hasn't blown up in a bigger way in the miniature sculpting community. It is cheap. It is plentiful. It is two-part (like epoxy putty). It is sand-able, grind-able, drill-able, pin-able. It is hard without being fragile. It plucks cats out of trees on Saturdays, and by next week it will have replaced you at your job. Well, those last two may not be true, but all the rest of those qualities sure are. And it does all of these things without demanding anything more of the sculptor. If you know how to work Greenstuff, then you know how to work Apoxie Sculpt. It comes in two parts: Part A and Part B. You scoop out equal parts of A and B, mash them together, and you are left with putty that has a workability time similar to Greenstuff. I believe that Part B is the hardening agent, if you're into knowing/hacking things like that, but I've never really experimented with varying the mix from anything other than 1:1. One definite way in which Apoxie Sculpt differs from Greenstuff is in texture. Where Greenstuff can be resistive and a little elastic, Apoxie Sculpt is a little softer and a little more yielding. 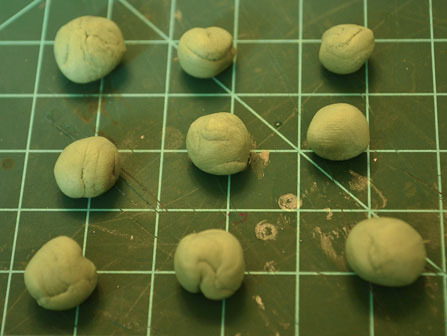 If you spread greenstuff thin across a surface, it stretches out (something like silly putty, if you're familiar with it), whereas if you do the same with Apoxie Sculpt, it will eventually reach a point where the material is too thin and it starts to break/crumble (like plasticine). In fact, that is probably the best simile I can provide: that if you were a kid who played with clay in Canada or the United States, Greenstuff works like and has a consistency kind of like Silly Putty, and Apoxie Sculpt works like/has the consistency of a mix of Plasticine and Play Doh. I had already been using Greenstuff for a year or so when I tried out Apoxie Sculpt for the first time. Prior to the introduction, I'd been miserly with my Greenstuff: often constructing the substructure for models out of tinfoil or super-cheap plumbers putty (which I do not recommend. I shudder to think I used that vile stuff when constructing Hel. It got the job done, but its cure time was painfully short, and it got freakish hot while curing). When I discovered Apoxie Sculpt, I was unfamiliar/under confident with it, so I used it to rough out substructure, and then I'd apply a Greenstuff skin on it to do fine detail work on the surface. It was a waste of time. As I quickly realized when feverishly sculpting scads of Mycetic Spores and Tyranid barricades for the Infestation of Casavant Prime table build project, Apoxie Sculpt was just as capable as Greenstuff when it came to taking detail. It was easy to mix in large quantities, and easy to work with over large areas. All I needed to do was accustom myself to the consistency/properties of the stuff through some practice building terrain, and I was able to use it as happily as I had previously used Greenstuff. If I had to strain myself and fault Apoxie Sculpt for anything, it would be that, though it's tacky enough to adhere to a wireframe or a miniature, Apoxie Sculpt is not as tacky as Greenstuff. Also, when you start getting into the realm of really microscopic detail, Greenstuff may win out, slightly, over Apoxie Sculpt due to it taking sharp edges slightly easier and its ability to stretch. 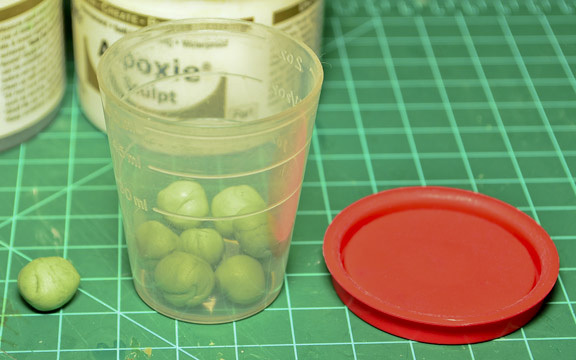 There are a few weird things that Apoxie Sculpt does that Greenstuff doesn't do, and I thought I'd highlight them to make sure you didn't think you'd gotten a bung batch when you start working with Apoxie Sculpt. First of all, when you first mix Apoxie Sculpt, it gives off sediment/residue, in a way similar to (though in far smaller quantities) traditional clay. The stuff is a bit of an annoyance, but it disappears quickly, and I keep a pot of water and towel nearby for rinsing it off my hands after I've mixed the putty. The other weird thing that Apoxie Sculpt does is change its texture a little ways into the curing process. Ed Fortae, over at Troll Forged Miniatures (if you've followed Troll Forged in the past and are wondering why there have been no updates of late, best to look Ed Fortae up on Facebook as he's going through a massive mold-retooling-for-plastic process, and he's posting updates on his wall) is very much of the Old Guard when it comes to Apoxie Sculpt. He was using it before any of us to sculpt MASSIVE things, and he turned us all onto it. Anyway, Ed claims that to get the best results out of Apoxie Sculpt, you should mix it up and then not touch it for about 20 minutes while it sorts out its consistency issues. I'm impatient, so I tend to start working with it right away, but I have noticed that, early in the curing process, the putty's texture is more akin to plasticine, but after 20 minutes or so it sets up into a far smoother consistency. The best way to judge this is to experience it, and if you are weirded out by it's texture right away, try waiting 10 or 20 minutes before going to work. Now that we've gone over Epoxy Putty and Apoxie Sculpt, you may be wondering which is the better putty. Well, rather unhelpfully, I'd say it depends. If I was evacuating a Craftworld with the Doom of Malan'tai at my heels, and I had room enough for only one putty, I'm not sure which one I'd choose. I feel like Apoxie Sculpt is easier to work with and is more forgiving, but the idea that it is more forgiving may be based on getting large quantities of it for a cheap price. Greenstuff is a decent putty for all circumstances, but the larger the scale I want to use it in, the more I find it frustrating, so I guess it's ideally suited for fiddly little work. So, were I pressed into choosing between Apoxie Sculpt and Greenstuff, I'm not sure I could make up my mind. Fortunately, though, I don't have to choose, and neither do you. I'm going to wrap up this article with some wonderfully weird things I've learned about putties, and one of the most important secrets I'd like to share with you is that, when it comes to choosing between Greenstuff and Apoxie Sculpt, you can very much have your biomass and eat it, too! Over the years I've stumbled upon some secrets to make Greenstuff and Apoxie Sculpt bend to the will of the sculptor a little more. I always assumed that I had learned these things from Hydra, but half the time he claims that they were my crazy idea, so who knows where they really came from. Up until this point, I have discussed using Greenstuff and Apoxie Sculpt separately. Like I've already mentioned, when I began working with Apoxie Sculpt, I would rough out the substructure using Apoxie, and then I'd apply the surface detail using Epoxy. However, somewhere along the line, some lines got crossed, and I wound up mixing Apoxie Sculpt with Greenstuff. I swear it was Hydra telling me to try combining the two putties; he swears it was me misunderstanding his tip to mix a little bit of Fimo into Greenstuff to make it less elastic. Regardless of how it happened or who deserves credit for it, it happened, and the product, ApoxieGreen, was the best thing to happen to either one of us. Combining the two putties creates this synergetic mix that preserves all of the robust qualities of the Apoxie Sculpt (sanding, drilling, grinding, toughness, etc), while taking on more elasticity from the Greenstuff. What's more, your Greenstuff goes further as you're combining it with an equal-or-greater quantity of Apoxie Sculpt filler, which is far cheaper than Greenstuff. The mixing of the two putties loses nothing. Though when using Fimo to cut Greenstuff in order to change its consistency you need to worry about mixing in too much Fimo and keeping it from setting, the ApoxieGreen sets after a space of time similar to Greenstuff or Apoxie Sculpt. By varying the amount of either Apoxie or Greenstuff, you can make the hybrid putty softer or more elastic, but it's something you need to play with in order to find the mix you prefer. The hybridization process is simple. Mix an roughly equal amount of Greenstuff and Apoxie Sculpt. For some reason, I always wind up mixing more Apoxie Sculpt than Greenstuff by accident, but you can always add in more Greenstuff if the texture is too Apoxie-Sculpt-like. Next, fold/braid/generally mash the Greenstuff into the Apoxie Sculpt until you have a uniform colour (it will be lighter green than the Greenstuff, obviously). ...and you're good to go. I apologize for the wacky lighting difference between the pictures. One way in which two-part epoxy putties lose out to things like Fimo and Super Sculpey and that most-rudimentary-of-sculpting-compounds, clay, is that while these latter compounds can be worked and reworked and revised ad nauseum until you are absolutely certain that the end product of your sculpting is what you intended, epoxy putties are slaves to chemical reactions and time. What we gain in terms convenience in not having to bake/fire our sculpts, we lose in time as the same chemical reaction that makes firing unnecessary also makes our epoxies unworkably hard after 2-3 hours. However, Hydra and I have discovered over the years that this 2-3 hour terminator line is not, necessarily, absolute. With a tiny bit of effort on the sculptor's part, he or she can make epoxy putties set faster or slower, as required. My high-school-level grounding in Science leads me to surmise that the chemical reaction that takes place when you mix two part putties is an exothermic one. However, I'm probably wrong about that as it would mean that, while the separate parts are reacting with one another, they should be giving off heat, which they don't in any way I've ever really noticed. The reality is, likely, that the reaction is a thermosensitive (C. Mr_Pink and his busted school of pseudoscience), which is to say that the chemical reaction taking place in the epoxy/apoxie compound is affected by heat or cold. The most obvious consequence of this, which Hydra definitely turned me onto and which some of you may have encountered before, is that Greenstuff and Apoxie Sculpt like heat. The warmer they get, the faster they set. This is a fact that you can very much take advantage of if you're trying to do quick work, and you're getting impatient with how long it is taking the putty to set. Remember those Halogen desk lamps that you weren't allowed to have in your university dorm rooms because they got so hot they could cause fires? Well, you should already be using one of them at your workstation as it's the best way to heat up and bend plastic models. However, if you haven't got one yet, make sure to pop out to your local Big Box Swedish Furniture retailer because you can buy them for between $10 and $30, and they are absolutely indispensable to converters and sculptors. That is because these lamps are the easiest way to fake bake your Apoxie Putty, Greenstuff, or ApoxieGreen. Since the compounds are responsive to heat, you can artificially speed the curing process by heating up what you are sculpting. There is no better way to do this than to plunk your sculpting under one of these heat lamps. It heats the putty from the outside in, making the surface harder than the interior. 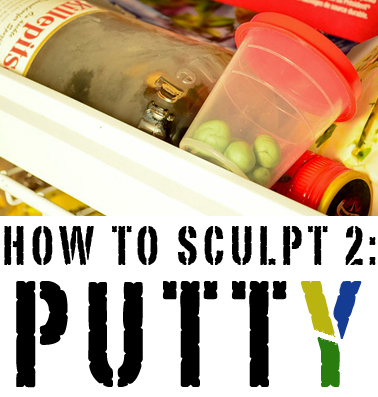 Therefore, you can get back to work on your sculpting sooner, but use a bit of care as, should you press into the quick-set putty too forcefully, you could still, conceivably, distort your sculpting by moving the still-uncured putty further inside your sculpt. That being said, don't take the above picture as a good example. 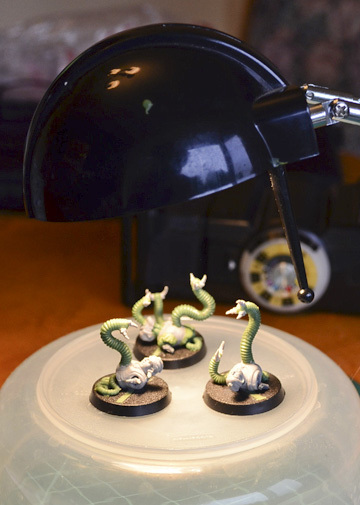 You'll need to place your sculptables on something ceramic, metal, or wood, and you'll have to make sure they are not attached to plastic or resin models, like these hemavores. Halogen lamps at close range will cause the outer layers of putty to set quickly so you can get back to sculpting on more detail sooner. However, halogen lamps at close range will also obliterate anything like plastic or resin or tupperware, leaving you will a foul-smelling chaos spawn where you once had a beautiful model. Also, though it should be obvious, don't leave your sculpting alone under a halogen lamp while you go out for a bike ride. Halogen lamps are safe when supervised, but they didn't ban these things from dorm rooms without good reason! As is par for the course, I blame Hydra for this innovation because he was working with huge quantities of Apoxie Sculpt while he was attempting to build a biotitan at my apartment, and he kept popping the excess in my freezer. However, when he was visiting Canada recently, he looked at me like I had seven heads when I went through the following process in front of his eyes. 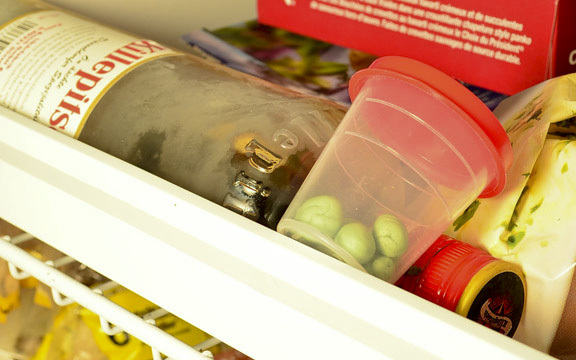 When I asked him what he was so shocked about as this whole thing had been his idea, he explained that, though he would transfer the same hunk of Apoxie Sculpt or ApoxieGreen in and out of the freezer, he'd never conceived of portioning it out and only using a little at a time. So, for your benefit, here is how I get a lot more millage out of my ApoxieGreen. Once I've mixed up a pile of putty, it is usually the case that I have more than I actually need at any one time. ...and then I pop that container into the deep freeze. Simple. Obvious. But it makes a world of difference. I haven't run extensive tests on the process, so I don't know the absolute timeframe for which the ApoxieGreen can remain viable in the freezer. However, I've used this process enough to know that the expiry window for the putty changes from being measured in hours to being measured in days. Now, the freezer slows the curing process, but it does not stop it entirely. I've had success using frozen ApoxieGreen on the day after it was mixed, or even as long as three or four days later. I think it all depends on the temperature of your freezer, with colder temperatures doing more to prolong the life of the putty. I've used putty that has been in the deep freeze for a nearly a week, but I wouldn't have used it to sculpt with as it was already getting rubbery and would only allow itself to be rolled out into tentacles. That being said, if you're planning on doing a solid day or two of sculpting, you can use the deep freeze method without worrying that you will lose too much in the way of workability. What's more, you will save a TON of putty and time as you don't need to be constantly remixing. Alright. That has been one heck of a blather for a second article. I have all kinds of stuff I want to talk about in terms of strategies and practices for actually working with putty using the tools I previously mentioned, but I'll save that for next time as I don't want this article to be overly long/to overload anyone's senses. I hope what you've read here today has made you a little more comfortable with the idea of working with putty, and I hope to elucidate the practice even further when I continue the How to Sculpt Miniatures series. You didn't mention the role of water in using putties! Like with green stuff how you should wet the tools so it doesn't stick to them or using water with Aves Apoxie Sculpt to make more like a paste. I've used Milliput mixed with Greenstuff in a similar way to your ApoxieGreen and it works in similar ways too. I've also used small amounts of vaseline mixed in with greenstuff to make it much smoother and softer to work with and removing lots of it's stickyness. And I really enjoy reading your articles, they are really informative and on a right level. Speedfreek, that's cool to hear. I've never laid a finger on milliput, so I wouldn't have known. What is the hybridized mix of milliput and greenstuff particularly useful for? I guess the various putties are similar enough and that, should you have enough of the greenstuff to begin with, the chemical reaction taking place in it more or less "carries" the other putties. Though I've never used Vaseline myself, I will be touching on something similar in my next article. I'm glad you're enjoying them so far. Yesterday was my first day trying Apoxie Sculpt. It felt a bit weird and I also noticed it was play doh like and that darned residue it left on your hands lol. It felt more stable to use after it started to cure a bit. The darn detail I kept trying to do was crumbling off until it cured a bit haha. In the end, I was able to sculpt my Tervigon sphincter openings ten times better with AS over GS. AS was more forgiving for this job. I be super happy that you pointed me to an Ontario based retailer of AS. I may have to try that GS/AS combo and see if that play doh feeling goes away a bit. Oh yeah another weird thing with AS. When I used water to smooth it out, a thin layer of AS would get super runny and run off a bit with the water sometimes lol. As for the water, you may be using too much, or this may be more of that residue I described. In my next article, I'll be touching on a better alternative to water for lubing up the putty. Ah so that's its "breaking point" with the ridge/protrusion sculpting. I somehow managed to pull it off ok for my first date with AS, but I will be using your Apoxiegreen(TM) combo for sure for future stuff. Deepthought: We. Are. The Hobby. The Shambling Masses: Wracks. Done.